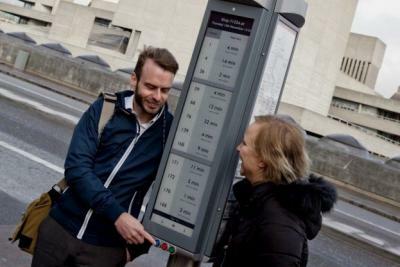 London just installed several solar-powered e-paper (E Ink) bus arrival times and interactive bus route maps on some bus stops. Buttons at the bottom of the screen allow the user to choose between real-time arrival information, route maps and important service notifications. The new e-paper displays are based on Visionect technology and designed by Technoframe. Visionect installed similar solutions in Sydney, Australia and in Ljubljana.